(Nanowerk News) Researchers in Canada have designed and fabricated a single-sheet graphene p-n junction with two top gates ("Fabrication and measurement of graphene p–n junction with two top gates"). The standard technique, using a top and a bottom gate, can lead to damaging of the graphene layer. This is avoided in the new method, which also offers linear I-V characteristics at low gate voltage. The two-top-gate structure is expected to be a practical route to a room-temperature terahertz source. The graphene layer has two gates to create local changes in charge carrier. Graphene behaves as a gapless semiconductor, with zero gap between the valence and conduction band. As a consequence, it is easy to tune between an n-type (electrons are the main charge carriers) or p-type (holes are the main charge carriers) semiconductor. Applying a positive gate voltage to the graphene will shift the Fermi level into the conduction band, creating a p-type semiconductor. A negative gate voltage will lower the Fermi level to the valence band, making holes the dominant carriers. This property means that a single sheet of graphene can behave as a p-n junction, as shown in the bottom figure. In this case, a positive gate voltage can be applied to the first gate, and a negative to the second, shifting the Fermi levels in those regions and creating the junction. Previous attempts to manufacture single-sheet junctions have used a top-gate in conjunction with a bottom gate. These techniques used the substrate as the bottom gate, which would lower the Fermi level of the entire sheet. A single top gate could then be used to raise the Fermi level locally. 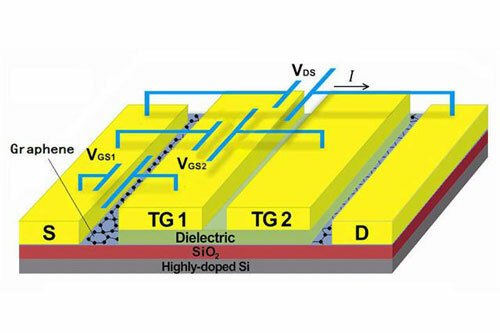 However, to overcome the bottom gate potential, the top gate voltage needed to be raised so high that the graphene became damaged or the I-V characteristics became highly non-linear. As the new structure only applies one gate locally, only very low voltages are required, which preserves the material and its linear characteristics. The low voltages also play a role in the device's suitability in THz production. Most semiconductors have a band-gap that is far greater than the energy associated with THz radiation. The zero-gap nature of graphene means that it can operate at these frequencies, as population inversion and electron-hole recombination can be tuned to any frequency, even the low-energy THz band. While the team have shown that their device can, in principle, be used for TH Z generation, much more research is needed to bring it to practical application. The group are now working on transport phenomena and temperature effects in graphene p-n junctions.